KATE JONES MADILL WAS BORN TO PAINT. RIGHT FROM A YOUNG AGE, EXPLORING HER CREATIVITY WITH A PAINTBRUSH WAS SECOND NATURE AS SHE FOLLOWED IN THE FOOTSTEPS OF HER MOTHER, WHO WAS ALSO AN ARTIST. “MY FIRST MEMORY OF DRAWING WAS WHEN I DREW RUDE LITTLE TEDDY BEARS AND I HAD MY CRAYONS CONFISCATED,” SHE LAUGHS. KATE SOLD HER FIRST PAINTING AT 14 YEARS OLD AND HAS CONTINUED TO MAKE A SUBSTANTIAL LIVING FROM IT. “PAINTING IS IN THE BLOOD. IT WAS JUST SOMETHING I THOUGHT EVERYONE DID. IT IS LIKE BREATHING TO ME. IF I DIDN’T PAINT, I WOULDN’T KNOW WHO I WAS,” SHE SAYS. 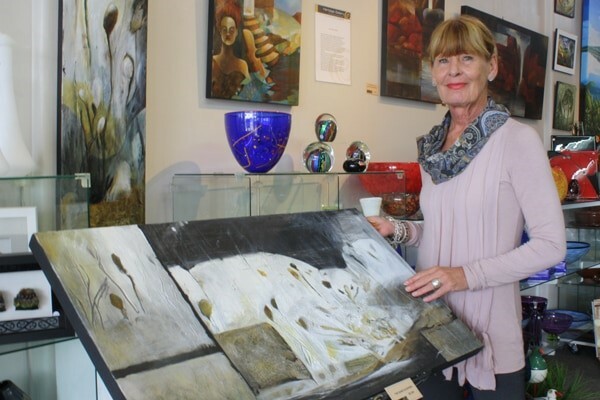 KATE RECENTLY MADE THE MOVE FROM THE BAY OF PLENTY – WHERE SHE WAS A REGULAR EXHIBITOR IN MANY GALLERIES – TO THE TRANQUIL BEACH AT WHANGAMATA, AND IT WAS A MOVE SHE IS THANKFUL SHE MADE. SITUATING HERSELF THERE HAS INSPIRED A WHOLE NEW SET OF WORK, WHICH STEMMED FROM BEING SURROUNDED BY BREATHTAKING BEACHES, SHELLS, SEAWEED, AND THE NATURAL BEAUTY OF THE AREA. WHEN KATE IS PAINTING A NEW PIECE SHE TAKES IN HER SURROUNDINGS AND OFTEN USES SNIPPETS OF NATURE THAT SHE HAS FOUND ON THE BEACH IN HER PAINTINGS TO GIVE IT TEXTURE. “I USE MY SURROUNDINGS. EVERYTHING I SEE AND HEAR, I PAINT. I PAINT HOW I FEEL ABOUT IT,” SHE SAYS. BUT EVEN AN ARTIST, WHO ADMITS THERE IS INSPIRATION AT EVERY OUTLOOK, HAS HER DOWN TIMES. FORTUNATELY FOR KATE, THOSE TIMES ARE FEW AND FAR BETWEEN AND SHE FEELS INCREDIBLY BLESSED TO BE ABLE TO MAKE A LIVING OUT OF HER PASSION. SHE WORKS FROM HER QUIRKY STUDIO AT HER HOME IN WHANGAMATA AND FINDS THAT IS WHERE THE IDEAS FLOW. “I GET OUT AND PAINT IN MY STUDIO MOST DAYS. WHEN I’M ON A ROLL, I BARELY COME OUT,” SHE LAUGHS. KATE DESCRIBES HERSELF AS AN “EXPRESSIONIST PAINTER.” HER STYLE HAS SOMEWHAT EVOLVED FROM HER BEGINNINGS WITH WATERCOLOURS AND CONTINUES TO STUN ONLOOKERS IN TERMS OF SUBJECT AND TECHNIQUE AS SHE NOW WORKS ALMOST EXCLUSIVELY IN ACRYLIC. WHEN PUTTING HER WORK ON DISPLAY AT ANY EXHIBITION THERE IS JUST ONE THING KATE SAYS SHE WANTS FROM THE PUBLIC. “ALL I WANT THE PUBLIC TO DO IS TO TAKE THE TIME TO STOP AND LOOK AT ARTWORK, RATHER THAN DISMISS IT. THAT IS ALL MOST ARTISTS WANT – IT IS A RESPECT THING,” SHE SAYS.